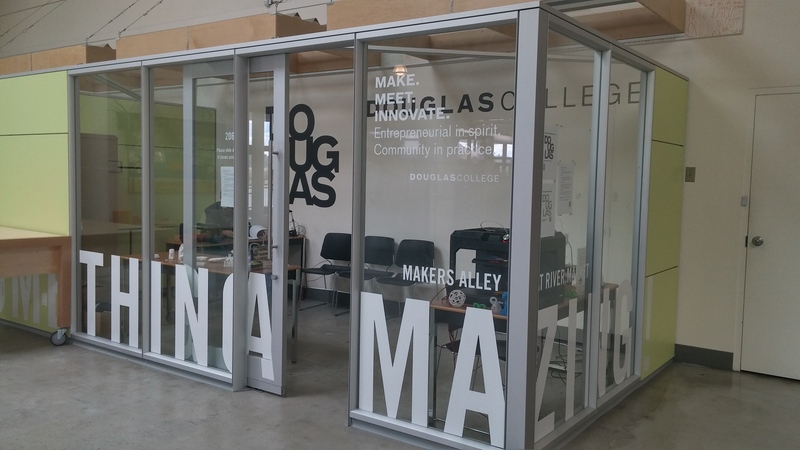 New Westminster’s River Market has a new tenant: the Douglas College Maker Lab. Located on the second floor with a full view of the Vancouver Circus School, the lab, which is a makerspace, bridges the college with the community to share in curiosity and a love of technology. Because the lab has a range of printers, people of all experience levels can learn and interact with the medium. To use the most user-friendly 3-D printer on site, the MakerBot, all one has to do is download a plan from the website Thingiverse.com, put the file on a USB, and plug that into the printer. As the length of each printing project can vary between 45 minutes for very small pieces and nearly 20 hours for large and complex ones, it’s currently difficult to book appointments for printing. The lab will also be hosting free Innovation workshops every second Tuesday starting on May 12 that will run from 7:30 to 9:00 p.m. Each event will have a theme, with the first being multi-modality and infographics, where people will learn how to create infographics and convey information through imagery. The second will have the theme 3-D printing and take place on May 26. There will be pre-registration for people who are interested, and each session will hold around 25 people. For students who wish to drop in during the summer, a staff member is likely to be in the lab Fridays from 11 a.m. to 2 p.m. Once the Fall semester starts, it will be staffed Monday–Friday during the same time period.